A few years ago I had an ulcer and I would get dizzy after almost every meal. There was a point when I was afraid to eat. I lost twenty pounds when I didn’t need to lose weight. I was a complete wreck inside. It took me two and half years to get my stomach back on track. I tried one thing at a time until I found what worked well for me. I can no longer drink coffee or eat tomatoes or other acidic foods. And man, did I did love a good cup of coffee to help get my morning going. Still, I’m actually grateful for my ulcer. It was one of the best illnesses to ever happen to me because it helped me become a healthier person. I was only able to overcome it because of my gratitude journal. Each day, I thanked the foods that didn’t cause me to feel dizzy. As I journaled more and more about these foods, I began to see patterns, which helped me ascertain which foods to eliminate. I put my energy into appreciating the foods that helped me feel good instead of complaining about the foods that made me feel sick to my stomach. And that helped me both heal and keep a positive attitude. This is why I suggest everyone keeps a gratitude journal. It helps you see things that you missed before. It encourages you to focus your attention on things that are making your life better. The best part is gratitude not only helps you live longer because it helps reduce stress, it also helps you build stronger relationships because you are more likely to share your appreciation with others. And when you regularly practice gratitude, you’re generally more empathetic and less prone to envy—great for your mental health and your relationships. It took me some time to turn gratitude journaling into a daily habit. When I first started, I would miss days at a time. It took almost a year to get a consistent habit going. Once I made gratitude a regular practice, it helped keep me sane since I was focusing on the things I had in life instead of wanting a situation to be different. This was a huge mindset shift for me. As I got busier I started getting away from my journal again. Then, as my father was passing, I leaned back into it, but I wanted to go a little deeper. I started writing stories in my gratitude journal, which helped me uncover details I hadn’t really processed before. I noticed him getting grumpier as he got older. My journal helped me see that I didn’t want myself to fall into the same bad habits. And I didn’t have to. I had a path to build a better attitude. I quickly noticed my new attitude changed how people responded to me. For example, coworkers started gravitating toward me because I was letting them know that I appreciated them. Who knew that a little appreciation would help you build friendships? I also noticed that the migraines that used to start at the base of my neck weren’t as intense. Gratitude was not only improving my attitude and my relationships, but also my health. I felt like I’d stumbled upon a magic formula for life. I know that people have been talking about gratitude for thousands of years, but it felt so refreshing to me. I did some research on gratitude and found some amazing studies. In one book, Why We Do What We Do, researcher Edward Deci explains that when someone has six positive interactions to one negative, they are 31 percent more productive. When you have positive thoughts and interactions, it’s easier to focus on what matters. That may be spending time with your family, traveling, or writing. Positive interactions free you up to have the energy to do what matters to you. The intense focus of finding some small bit of gratitude in every situation really changed me. Sometimes the lesson was to breathe into my belly more. Other times it was learning from a really smart coworker who handled the meeting very well, kept us all on track, and helped us get a lot accomplished. Because I started small, I planted seeds to be able to go deeper into gratitude. If you too would like to create more positive feelings and interactions, I highly recommend starting a gratitude journal. And it can actually be really simple. I’m grateful for my coworker because she is always willing to listen and help. I’m grateful for my ability to dance in my car seat when I’m stuck at a traffic light, because it allows me to release my stress. I’m grateful for my pets because they make me feel loved and needed. The key component here is your why. This is important because it helps you actually feel grateful, as opposed to just listing things you think you should appreciate. Soon you’ll likely start to feel a lot better about your work, your relationships, and even yourself. And before you know it, you’ll probably notice an improvement in your attitude—and major changes in your life. Karl Staib is the author of Bring Gratitude and the creator of the free 30-Day Bring Gratitude Challenge. Karl’s goal is to create an amazing community so can all help each other learn from our mistakes and build a life we love. Join from January 1st to 30th to help strengthen your mindset through the beginning of the year. 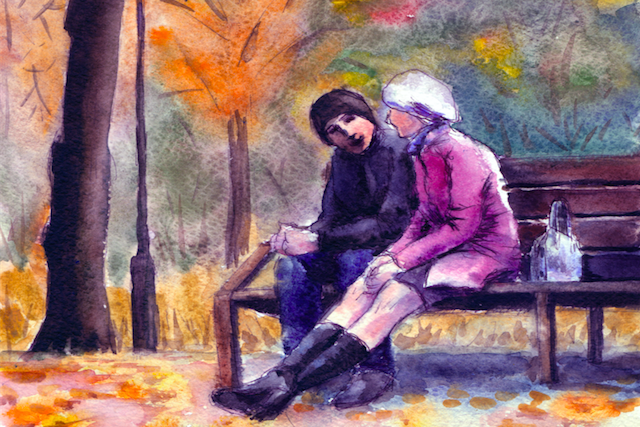 The post How Gratitude Journaling Can Boost Your Mood and Change Your Life appeared first on Tiny Buddha.